This week’s instalment of the #SBIDinspire series features David Chang’s Poly Garden Presentation Center. The Poly Garden Presentation Centre, located in Zhaoqing at the west end of the Pearl River Delta of Guangdong Province, China, is a truly exquisite residential project. The project was inspired by traditional Chinese culture yet the design is also modern in appearance. David Chang and his team pulled inspiration from both Western and Chinese culture, namely Emperor Song Huizong and the Song Dynasty (AD 1118) as well as beautiful Chinese calligraphy, to create a breathtaking project that also serves to regenerate the area surrounding it. SBID had the opportunity to speak with David Chang, Founder of David Chang Design Associates International. The project is located in Zhaoqing, and Zhaoqing is a prefecture-level city in west end of Pearl River Delta of Guangdong Province, China. Zhaoqing Poly Garden is a multi-family residential project, which was developed by state-owned developer, Poly Real Estate Group. The entire project covers an area of 140,000 square meters with buildable area of 360,000 square meters. The project is considered to be a major residential development that will regenerate the area and therefore upgrade the living standard of the city. This Client wanted to create a unique presentation center which embraces both western and Chinese culture in a modern yet classic context. In the Song Dynasty (AD 1118) the 8thEmperor Song Huizong changed the name of Duanzhou to Zhaoqing, meaning “the auspicious beginning of a festival”. Emperor Song Huizong possessed many talents which included painting, horse riding, archery and calligraphy. Notably he created a Chinese calligraphy font now called I“Shoujinti”; meaning “slim golden font”. 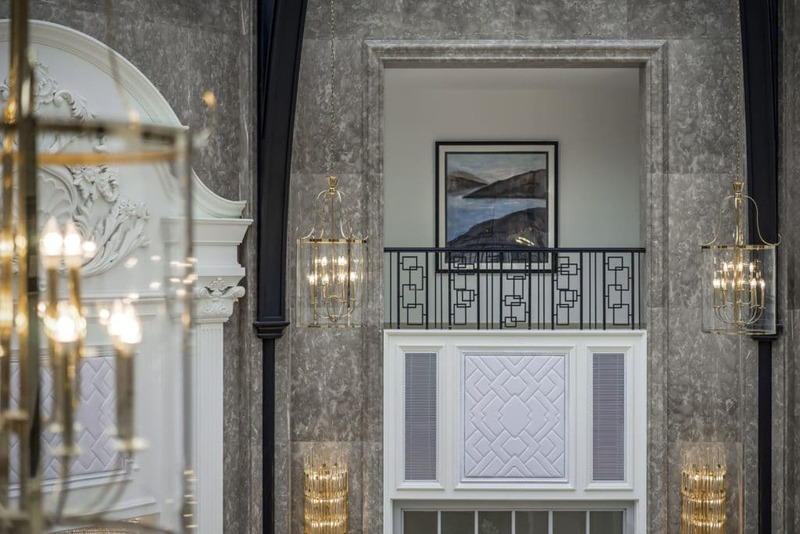 We incorporated the aesthetics of his calligraphy and silken painting style to develop the concept for the interior architectural space and integrated these into the detailing and motifs throughout the complex. The finely detailed and serene wall paintings, glass panel and mirror fretwork, refined railings and flowing line chandeliers all chronicle Emperor Song Huizong’s contribution to Chinese culture. We juxtaposed these references with classic Greek Corinthian columns and pediments that were used to pronounce the foyers leading from the central octagonal congregating hall to the display model area, bar, lobby and negotiating areas. The original structure had no skylight in the center of the building. In order to bring a large influx of sunlight into the inner building, we used inspiration from local architecture – a courtyard space found in Southern China, to create a 14 meter dome with a skylight. Not only does it give the space a sense of grandeur, but it also allows ample natural light to shine through. The delicate colour palette of black, grey and white is inspired by the aesthetic of the historic Chinese calligraphy brush, ink and ink stone. 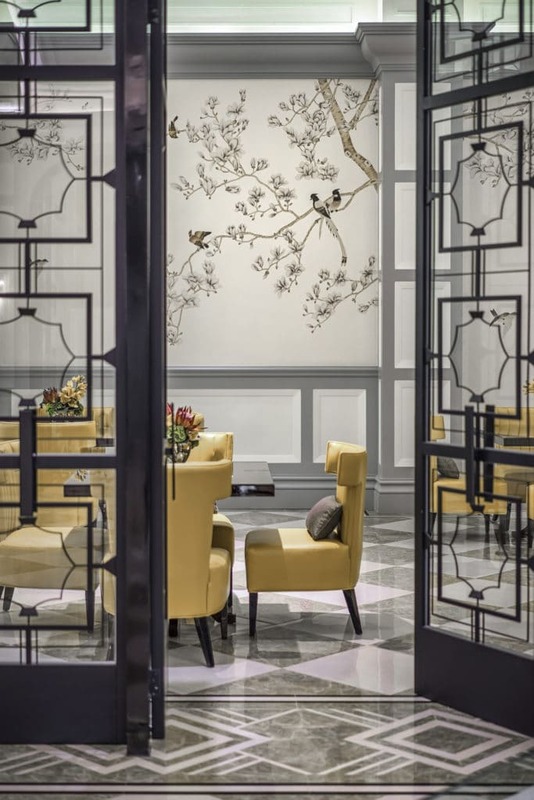 Soft veined marble in traditional fretwork patterns once again echo the delicate Song Dynasty influences. The soaring 14 metre high Octagonal-shaped Hall is crowned with a luminous stained glass skylight creating a strong sense of grandeur that reverberates throughout the entire project. Lofty gallerias and illuminated, tenderly curved barrel vaulted ceilings also echo this majestic ambience. We desired to share our amazing design with the world, and SBID is an international and prestigious award, which not only recognises the excellence in design but also serves as an excellent channel to expose it to the world.